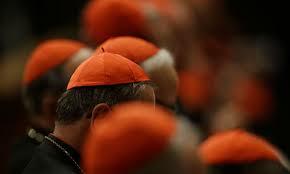 I am not a Roman Catholic but I am a Christian and all Christians are interested in what happens in your Conclave. Yes, the Pope assumes the throne of St. Peter, the rock on which Christ Himself built His Church and as such what happens in your Conclave is our business. Dear Cardinals, as you go in and enforce a total ban on eavesdropping, installing anti-electronic devices, shutting out the internet and with it the pesky social network crowd, know that the all Seeing Eye is watching. Not the single, silly eye illustrated in the logo of the Illuminati, but the eye of God Almighty. And, certainly not Dan Brown’s eyes. Remember that God is watching and, please, please, eschew racist, regional politics. The media is full of talk of the Brazilian Cardinal, the African Cardinal, the Italian Cardinal; but the media is always looking for leads and when they can’t find any they fabricate: A poor example of their agenda-setting function. Or is the media right? Do you really have factions? Like in the PDP? Like in the GOP? Don’t tell me you do? You all look holy and papal in your long flowing robes. Let me be serious now. The Roman Catholic church needs a Pope: the younger and more vibrant, the better. A man who will take the bull by the horns, like St. Peter himself. A man willing to fight for the Master and ‘cut off the ear’ of any impediment. The cases of sexual abuse and of sweeping issues under the carpet are really damaging. Christ himself famously threw out the traders selling in the temple. I know St. Peter would have thrown them all out in half the time it took Christ. Think about this as you ‘elect’ someone to sit on the throne of Peter. Will he throw errant Men out of the church? Dear Cardinals, the churches are empty. Yes, Africa and South America are overflowing with members, but your European cathedrals have become tourist sites. Not a good image for Christianity. So give us a Pope with a good image, with panache and the Spirit. A ‘missionary’ to evangelize the Old Continent and America. Yes, the good old USA. Do you still have adherents there? Not many I guess. Let the Cardinal from New York find a wash basin and soap to wash his socks. Then fold his sleeves. For the work is much and the labourers few. Conclave is serious business and he can endure a few indignities . The Son of Man had nowhere to lay his head and St. Peter was but a poor fisherman. So dear Cardinals, take your time. This is not the Middle-ages, where they cut the food rations to speed up the election. Or once removed the roof because the Cardinals took over two years to elect a Pope. We are all here watching, with bated anticipation, at the colour of the smoke. Dear Cardinals, accept the assurances of my highest regards. And oh, my money is on the Italian.